Another action packed week at High Mill Lake this week with 10 anglers on from Ireland, Spain, Germany and Holland with Ireland coming out on top. Sadly no fish for the Spanish on 6 or the Germans on the chalet swim. 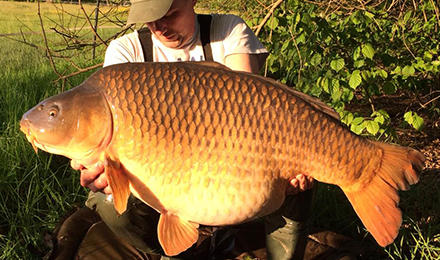 Kees and Jarno did pick up 3 nice fish on swim 1 with 2 over 40lb on garlic and robin red boilies. But records were smashed all over the place by the 4 Irish lads up on swims 8, 10, and 11 whilst the fish were all up the top end getting ready to spawn. 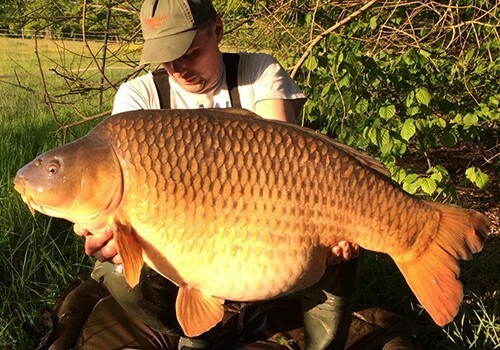 On a mixture of Mainline Cell and MTC garlic boilies they landed 46 fish between them including 19 over 30lb, 1 of which was a lovely grass carp at 32lb 2oz, 6 fish over 40lb and a 54lb 12oz common. Overall average for the week was 30lb. 7 anglers around High Mill Lake from Ireland, Holland and the UK. Weather continued to be unsettled and very changeable with high winds and cold overnight. The fish still haven't spawned yet but the sun is forecast for a few days now so that may get them started. But we had 70 runs with 49 fish landed on a mixture of Mainline Cell and MTC Triple R Garlic. John and Lorraine fished the chalet swim and broke John's previous PB of 46lb 2x firstly with a 48lb 8oz mirror which he then followed with a 50lb mirror. More PB's for the 2 Irish lads on 11, Paul and Jeff who finished with 7 fish to 33lb. The 2 English lads Anthony and James on swim 10 did well too landing 13 fish including mirrors at 40lb and 45lb 8oz and a common at 54lb (all on Cell) to give them an average for the week of 34lb 6oz. But top rods this week were Dave and Cor, the Dutch lads on swim 8 who had 26 fish from 37 runs, all on MTC Triple R garlic including 2 mirrors at 44lb and 50lb 10oz. Overall average for the week was 30lb 13oz.